When I was a little girl, I recall my mother and her friend taking me to the cinema to see one of Walt Disney's classic fairy tale cartoons. I loved it. But what I recall most vividly from that outing was something my friend's mum said afterwards: "That simpering little princess doesn't hold a patch on the wicked queen - she was magnificent!" That comment really made me think. Beforehand I hadn't thought of it that way at all - I had admired and wanted to emulate Sleeping Beauty, Snow White, Cinderella, I had never before considered their adversary as being magnificent - but when I thought about it more, I realised that, yes, she was. In all those Disney cartoons, the Mistress of Evil is breathtaking - a beautiful, powerful, woman who can and does makes her own choices in life. The problem, of course, is that some of those choices are pretty bad ones, stemming from anger and jealousy. Often the wicked witch, queen, stepmother or fairy has been generally given a rough deal. But instead of being the long-suffering victim that society expects fairy-tale heroines to be, she commits acts of vengeance that turn her into a villain. The new Disney movie Maleficent turns that on its head. It stars Angelina Jolie as the eponymous wicked fairy from Disney's 1959 Sleeping Beauty and it tells the tale from her perspective. I went to see it earlier this week and I loved it just as much as I loved the movie I had seen as a child. I'm not going to give spoilers, so this review isn't going to go into details of what actually happens in the movie. 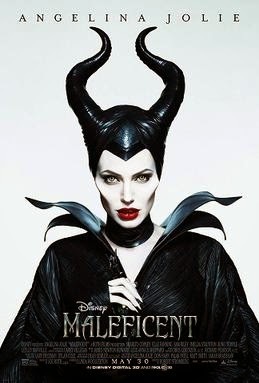 I will say that it is beautiful to watch and that Angelina Jolie is perfect in the role. It is thought-provoking and intelligent, a story of love, betrayal, revenge and, ultimately, redemption. The message is one of hope, that endings can be happy ever after - although you might have to redefine what happy ever after means. I went to see the movie on a weekday afternoon and I was probably the only adult there who wasn't taking their kids. The seats all around me were full of small children - not surprising really, seeing as it is a Disney film - but before it started I was a bit worried that the youngsters would be noisy, fidgety and distracting. None of them were - they were so engrossed in watching it they sat quietly in their seats all the way through. I would go so far as to say that Maleficent is a fairy tale that all mothers should take their little girls to see. But I would also add that women of all ages will love it so don't be embarrassed to go to the cinema to see it by yourself if you don't have kids to accompany you. I watched it with Hazel on the opening night at the adult-only viewing.....plenty of people there to get the audience atmosphere without the ankle-biters..... and, as you say, the whole audience was enthralled. I absolutely loved and it ad would recommend ANYONE to see it. I've loved Maleficent since I was little and I was scared they might sanitise her too much, but I'll give it a go!